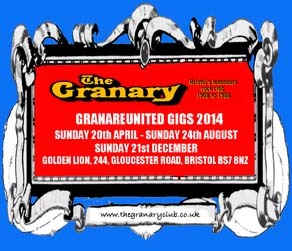 The next Granareunited gig at the Lion will be on Sunday 24th August. Join us for a night of classic rock which will certainly kick ask anybody! Our last Granareunited was in April and was huge fun for us all. Here are a few pictures. 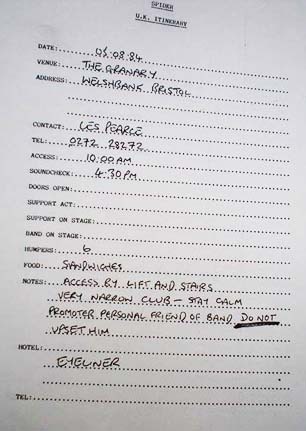 Details sheet for the gig on Thursday 9th November 1978 sent to WILD HORSES . 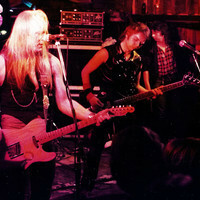 Wild Horses featured former Thin Lizzy guitarist Brian Robertson and former Rainbow bass player Jimmy Baine. 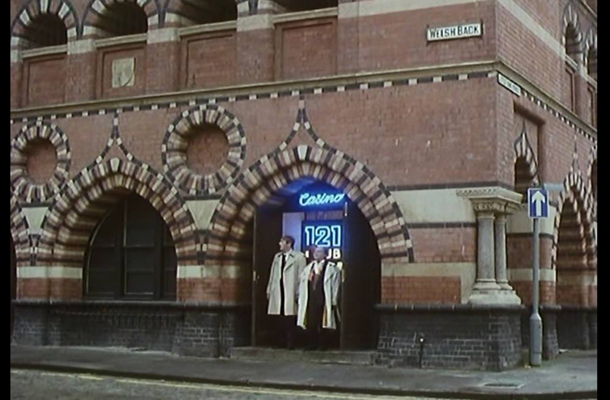 The famous comedy TV series used locations in Bristol for many of its scenes. Here’s a screen shot of Del and Rodney in the doorway of the Granary which, for the night, became a casino. They also filmed the famous scene where Del falls through the bar in the wine bar in the cellars underneath the Granary. We wanna see your face in the place! Japanese heavy rock band. Early 1987 the band had already relocated to the UK in a bid to crack the western hemisphere and had changed its name from Bow Wow to Vow Wow. They recruited ex Whitesnake bassist Neil Murray and the commercially successful album “V” was recorded in Ibiza. At this point Vow Wow were regularly featuring on the Friday Night Rock Show hosted by Tommy Vance and were responsible for most of the shows Jingles. Pictures supplied by Gran Fan Jezza Locke. a good shot too of “The Home of Rock”banner. DANGEROUS LIASON - LES & WEAPON! 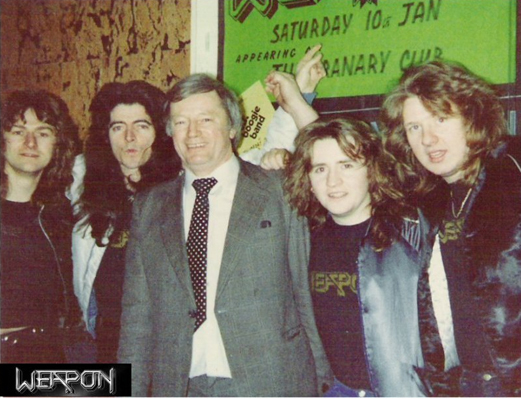 Hard rock band Weapon played the Granary twice - Saturday 10th January 1981 where they posed for this picture with Les and again on Saturday 8th August 1981. . Another one for the Granary archives. 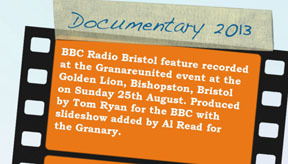 Granary DJs bringing back vivid memories of the brilliant nights spent at the Granary. Make a note in your 2014 diary of the dates and be sure to be at the Golden Lion for each one. The April and August dates are on a Sunday preceding a Bank Holiday Monday. 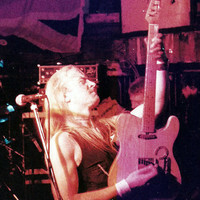 Steve Hall who was part of the road crew for rock band SPIDER. fourteenth appearance at the club and, unfortunately, their last. Thanks for this Jezza and good luck with the “Spider Boogie Fanwagon”. 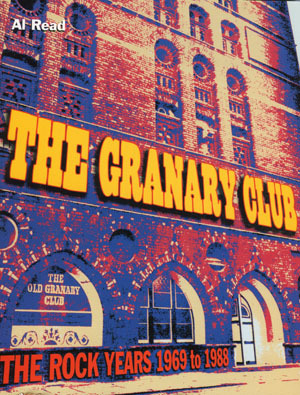 If you do have any Granary memorabilia or photographs, do let us know. 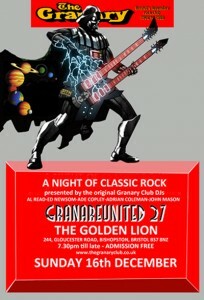 It’s going to be a great evening full of rock classics re-creating the glory days at the Granary. Free entrance to all to this Christmas gig of epic proportions! for the night. 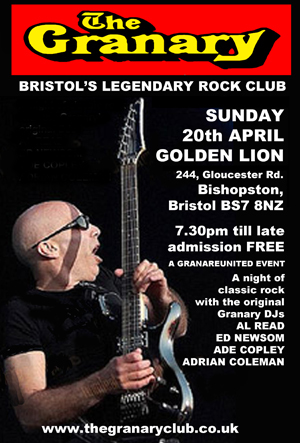 Bass player with both bands was Duncan Graham who was very much part of the Bristol scene at the time. He is now resident in Canada and, as a recent pic shows, is still playing! the club six times between 1980 and 1984. 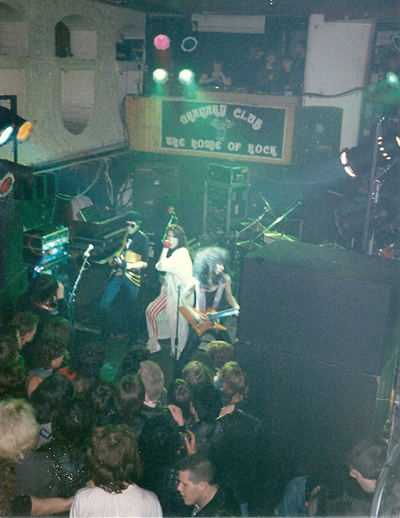 At their gig in December 1983 several tracks were recorded and can be heard on Sound Cloud. This cassette tape was sent to Vardis by fan D Watkins from Gwent. This was the first ever live performance of this song which is the title track of the 1981 album. This cassette tape was also sent to Vardis by fan D Watkins from Gwent. 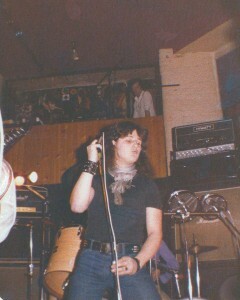 This was the first ever live performance of the song “Radio Rockers” later to be recorded in the studio for the Vigilante album. rock classics re-creating the glory days at the Granary. Free entrance to all to this Christmas gig of epic proportions! Dorset who bought the last copy in October 2013 almost 10 years after its publication. I can get some more stock soon and we can open up the shop again! 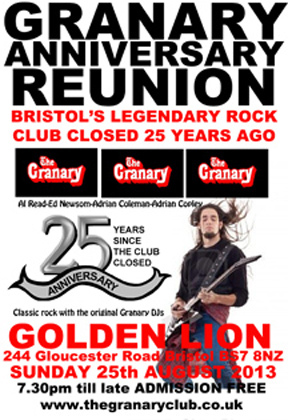 There are just two weeks to go to the 25th Granary closure Anniversary gig at the Golden Lion! Today I was rummaging through my classic rock CD collection puzzling whether I should feature”Touch too much” by AC/DC or should it be “Don’t Fear the Reaper” by Blue Oyster Cult? Then it hit me….it’s the Granary, play both! Yes it’s going to be a night of amazing rock tracks. 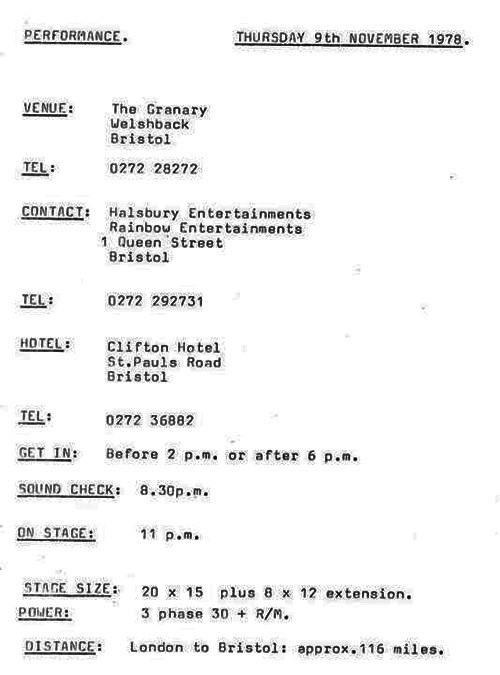 Recent posts on the “Granary-Bristol’ group page on Facebook have been tracks by AC/DC, Led Zeppelin, Thin Lizzy and Whitesnake. Bet most of these tracks turn up on the 25th. As well as the mass of marvellous music we will throw in (literally) a number of air guitars and a free raffle when you can win a unique Granary t-shirt. A special one off design featuring the many punk and new wave bands that played at the club. We will get underway at 7.30pm so don’t be late or you’ll miss some brilliant tracks. 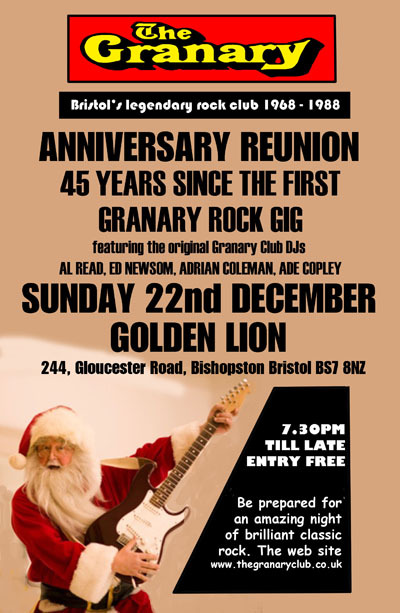 It is also likely that BBC will be there as they are planning a radio documentary aboutthe Granary and would like to include Granary fans memories of the legenday rock venue. See you there on the night, Al & Ed. Splendid picture of the Granary building featured recently on the front cover of the Clifton Life magazine. Very nice! 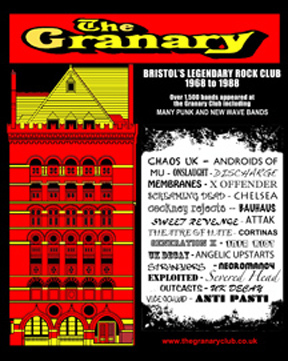 THE LAST NIGHT OF HE GRANARY WAS ON SATURDAY 27th AUGUST 1988. We will be marking that special day with our 25th Anniversary of the closure on Sunday 25th August 2013. Gran Fan A.J.Samuels was at the club on the final night and luckily had his camera with him. He captured the scene as the last few members left. 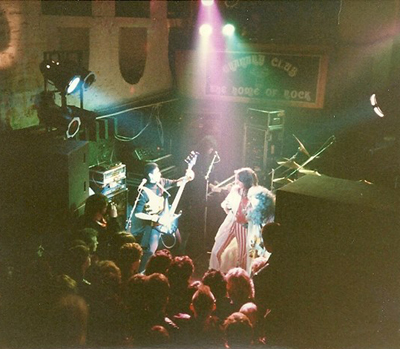 Stormtrooper were a favourite at the club in the middle 70s with 5 gigs recorded in the Granary book though they are sure they played many more gigs there. Back stage at the Granary Colin Boggy Bond from Stormtrooper takes his life in his hands sat under a dodgy roof that needs supporting by an acro prop. Also pictured in action on stage. IT’S THIS SUNDAY GRAN FANS! We’re geared and ready to that classic rock thing from 7.30pm till late this very Sunday. Masses of those classic rock tracks that made the Granary Rock Disco famous will be brought to you by the original Granary DJs. And it’s not just the music. Surrounded by Granary memorabilia you can drink at pub prices, take a dip into Santa Ed’s goodie sack. There’s a free raffle as well where you can win an original Granary framed poster from the early Seventies. Tell all your friends, be early, let’s make it the night of the years. The Granary lives on! Including all those classic tracks you remember so well from the legendary Granary rock discos. FREE admission and a FREE raffle to win a framed authentic Granary poster from the 1970’s. We’re pulling out all the stops, we’re turning it up to eleven, we’re going all the way, we’re on a highway to hell! We want to do it with YOU! 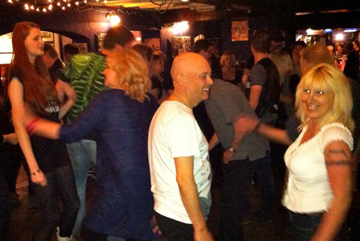 Classic rock from 7.30pm till late, don’t miss a minute! 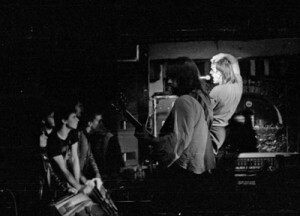 A.J.Samuels has been reworking some of the great pictures he took at the club during the glory days including this superb shot of Marillion on stage on Tuesday 23rd November 1982. Thanks a bunch A.J. Paul Merrell posted this on our Granary Facebook page. He’s doing his thing as lead vocalist of the band Stormtrooper who played at the club at least 5 times between 1976 and 1979. They were favourites as proven by the fact that DJ Al Read had stayed in the DJ box (top right) to watch them instead of his usual routine of rushing off to the bar. Nice one Paul! 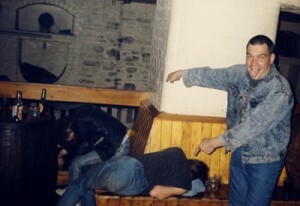 Thanks to Keith Hill for this post of two nameless Granary drinking buddies, one who thinks it’s hugely amusing that his mate has passed out on the seating around one of the pillars. 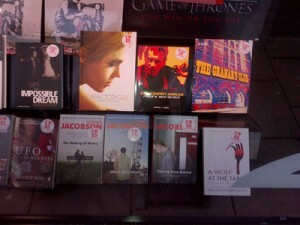 Granary book (to right) on display in the window of music shop FOPP in Bristol. There aren’t many copies of the book left now so now is the time to pick one up. FOPP have them at a very reasonable price as well. If you do buy one for a Christmas present, bring it along to the Granareunited gig and get it signed by the author and the Granary DJs. There will also be copies of the book available at Granareunited on 16th December. That’s it for this newsletter, we look forward to your company on Sunday 16th December at the Lion. 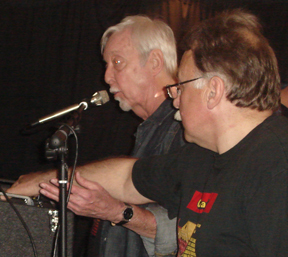 Keep the Granary alive and rockin’, Al & Ed.